The stronghold of the Dartford Warbler is located in Spain but the populations there have strong declined during 1998–2011. How will climate change synergically with fire-conducted vegetation dynamics affect the distributional range of Dartford Warbler over the next 50 years? Could fire management policies offset the potential distributional shifts of Dartford Warbler driven by climate change and land abandonment? The Dartford War bler was recently evaluated on a global scale as Near Threatened in the IUCN Red List, since it is declining at a moderately rapid rate (Birdlife International 2014). Declines in the core populations in Spain are largely responsible for the estimated overall decline of the species (Birdlife International 2004) due to habitat degradation and modification (Van den Berg et al 2001) and climate changes (Bibby 1978). Mediterranean landscapes are highly dynamic systems (Keeley et al 2012). Climate change is one of the most powerful driving forces of these dynamics and, in the Mediterranean basin, its severity has markedly increased in recent years (IPCC 2007). However, climate change impacts on biodiversity (Clavero et al., 2011; De Cáceres et al., 2013) are often also indirect through changes in disturbance regimes (Turco et al., 2014). Fire is a critical factor in the Mediterranean and is likely to drive landscape change effects over large areas. In this study, recently published in Journal of Ornithology, we ask the following questions: (1) how will climate change synergically with fire-conducted vegetation dynamics affect the distributional range of Dartford Warbler over the next 50 years? 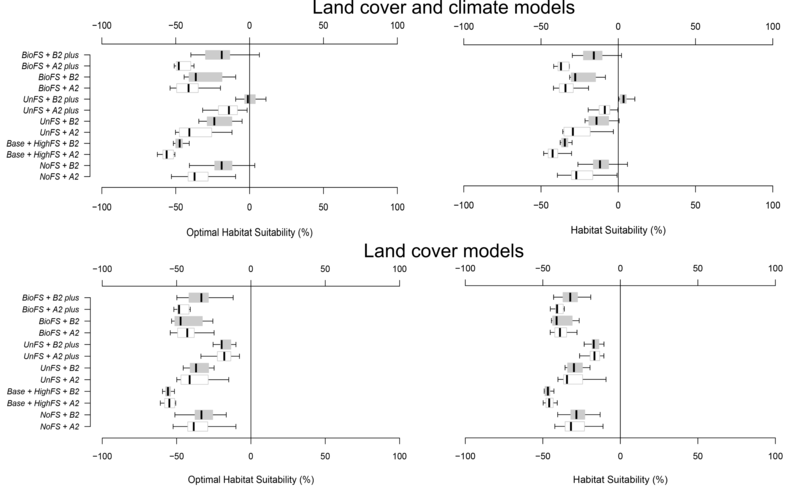 ; and (2) can fire management offset distributional shifts caused by climate change and natural succession processes? Our group, in collaboration with Antoine Guisan’s lab (Department of Ecology and Evolution, University of Lausanne), ICO (Catalan Institute of Ornithology) and EBCC (European Bird Census Council), have assessed the potential changes in Dartford Warbler distribution between 2000 and 2050 under different fire management and climate change scenarios, and described landscape dynamics using a spatially-explicit fire-succession model that simulates fire impacts in the landscape and post-fire regeneration (MEDFIRE model). For this study, Dartford Warbler occurrence data were acquired at two different spatial scales from: (1) the Atlas of European Breeding Birds (EBCC) and (2) the Catalan Breeding Bird Atlas (CBBA). Habitat suitability was modelled using five widely-used modelling techniques in an ensemble forecasting framework (BIOMOD2). 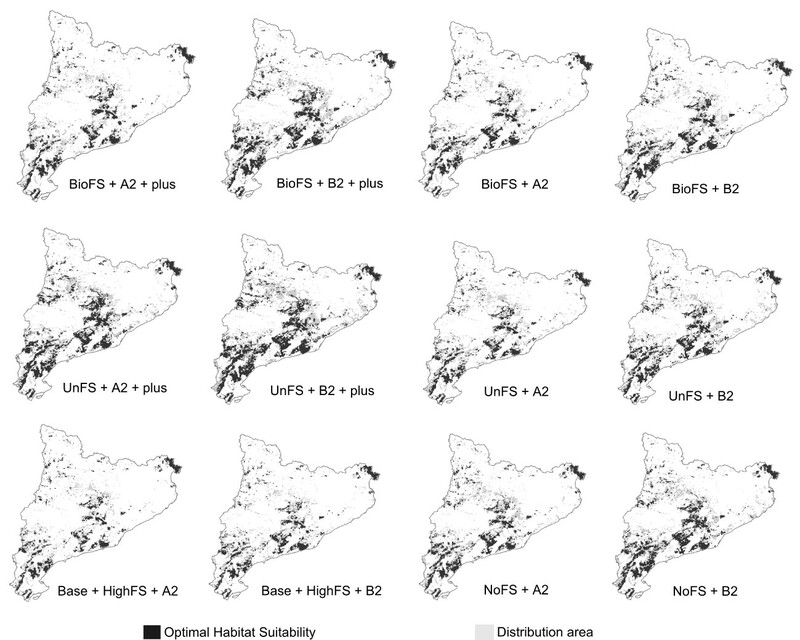 Our study predicts large habitat suitability losses in Catalonia mainly derived from successional losses and land abandonment (ranging between 47 and 57 % in baseline Base + HighFS scenarios, Fig.1), but these losses can be strongly modulated by fire regime shifts conducted by fire management, together with climate change (Fig. 1 and 2). Fig. 1. Predicted changes (expressed in %) in optimal habitat suitability between 2000 and 2050 under each fire management and climate scenario. The use of unplanned fires resulting from decreasing suppression efforts are tactics that use fire as a tool to fight larger wildfires, and that aim to increase the effectiveness of fire suppression through fuel reduction (Regos et al 2014). Unplanned fires increase landscape heterogeneity, offsetting the decade-long general trend towards homogenization due to land abandonment and the coalescence of natural vegetation patches (UnFS and UnFS plus scenarios in Fig. 1 and 2). Thus, early-successional species such as Dartford Warbler could be favoured in the future by this fire management policy, especially in those areas strongly affected by land abandonment. Fig. 2. The potential distribution areas (grey) and optimal habitat suitability (black) in 2050 under future scenarios. Our results thus highlight the need to take the spatial interaction among climate change, fire-mediated landscape dynamics and fire management policies in highly dynamic and fire- prone ecosystems into account to accurately predict habitat suitability changes of early-succession bird species in a context of land abandonment. Fire management programs must be integrated into conservation plans to effectively preserve sparsely forested and early-succession habitats and their associated species in the face of global change. Article posted at BOU’s blog – 24th of April (http://www.bou.org.uk/dartford-warbler-regos/). Bibby CJ (1978) Conservation of the Dartford Warbler on english lowland heaths: A review. Biol Conserv 13:299–307. Birdlife International (2014) Species factsheet: Sylvia undata. Downloaded from http://www.birdlife.org on 07/10/2014. Keeley J, Bond W, Bradstock R, et al (2012) Fire in mediterranean ecosystems: ecology, evolution and management. 515. This entry was posted in Publications on 24 July, 2015 by Adrian Regos.